Do you want to join us in our fight against poverty in the UK? Between 1st April and 31 March each year, employees receive 5 working weeks (pro rated for part-time employees) holiday entitlement plus Public/Bank Holidays. Headquarters also closes between Christmas and New Year and the time off is shared between the organisation and the employee. The employee is required to reserve up to 2 days of their annual leave entitlement for this time. Make the full Income Tax relief immediate, eliminating the need to claim back the Income Tax otherwise paid over the basic rate of 20% on your personal pension contribution. Benefit from an extra increase to the employer pension contribution equal to 50% of the saving Turn2us will make on its own National Insurance contributions. Private Healthcare is available with Aviva Healthcare at a discounted Group Rate. Interest-free, non-taxable season ticket loans are available following the successful completion of your probationary period. A cycle to work scheme is available through cycle solutions which offers the option to purchase a bicycle and equipment through a salary sacrifice scheme. Employee’s can request all types of flexible working and line managers will ensure requests are given the appropriate consideration. Courses of study leading to professional qualifications that are relevant and appropriate to an employee’s current or anticipated future job role are supported by the organisation. There is an equipped kitchen where you may make drinks and heat light refreshments. There is also a seating area provided for those eating lunch in the office. There are a restricted number of car parking spaces at Headquarters. To maximise usage of parking facilities, these are generally designated for use by senior managers and visitors. However, if any spaces are not in use, employees may arrange to use a space on occasion. Long service awards are given to employees reaching 5, 10, 15, 20, 25 and 30 years service. 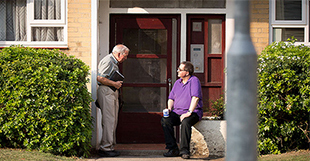 Find out how you can play a key role in getting help to others in need of our support.